Atrial fibrillation (AF) is the most common type of heart arrhythmia. During atrial fibrillation the heart can beat too fast, too slow, or with an irregular rhythm. 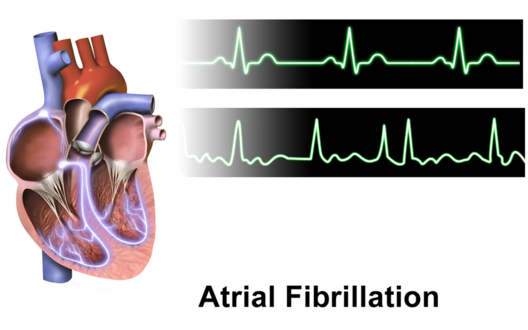 AF occurs when rapid, disorganised electrical signals cause the heart's two upper chambers known as the atria to fibrillate. The term "fibrillate" means that a muscle is not performing full contractions. Instead, the cardiac muscle in the atria is quivering at a rapid and irregular pace. This ultimately leads to blood pooling in the atria as it is not completely pumped out of the atria into the two lower chambers known as the ventricles. Atrial Fibrillations can occur independently or may be associated with underlying causes. AF not associated with an underlying cause is known as "lone AF". AF can manifest itself suddenly as in "paroxysmal AF" which terminates spontaneously or with intervention within 7 days of onset. If sustained longer than seven days it is known as "persistent AF". When it occurs continuously for longer than twelve months it is known as "long-standing persistent AF". The term "permanent AF" is used when the patient and clinician make a joint decision to stop further attempts to restore or maintain sinus rhythm. Acceptance of permanent AF represents a therapeutic attitude on the part of the patient and clinician rather than an inherent pathophysiological attribute of AF. Acceptance of AF may change as symptoms, efficacy of therapeutic interventions, and patient and clinician preferences evolve. Further, the term "nonvalvular AF" is a term used to describe when there is the absence of rheumatic mitral stenosis, a mechanical or bioprosthetic heart valve, or mitral valve repair. AF may occur in the elderly without underlying heart disease as well. Changes in cardiac structure and function that accompany the aging process, such as increased myocardial stiffness, may be associated with AF. AF with associated heart disease: specific cardiovascular conditions associated with AF include valvular heart disease (most often mitral valve disease), heart failure (HF), coronary artery disease, and hypertension, particularly when LV hypertrophy is present. In addition, heart disease leading to thicker ventricular walls (HCM), dilated cardiomyopathy, and congenital heart disease, especially atrial septal defect in adults are associated with AF. Potential etiologies also include restrictive cardiomyopathies (e.g., amyloidosis, hemochromatosis, and endomyocardial fibrosis), cardiac tumours, and constrictive pericarditis. Further, other heart diseases such as mitral valve prolapse with or without mitral regurgitation, calcification of the mitral annulus, cor pulmonale, and idiopathic dilation of the right atrium, have been associated with a high incidence of atrial fibrillation. Familial associated AF: familial AF, defined as lone AF running in a family, is more common than previously recognized but should be distinguished from AF secondary to other genetic diseases like familial cardiomyopathies. The likelihood of developing AF is increased among the offspring of parents with AF, suggesting a familial link to AF but the mechanisms associated with transmission are not necessarily electrical, because the relationship has also been seen in patients with a family history of hypertension, diabetes, or heart failure. Autonomic Influence in AF: in general, vagally mediated AF occurs at night or after meals, while adrenergically induced AF typically occurs during the daytime. Beta blockers are initial drug of choice for adrenergic dominated AF. Atrial fibrillation (AF) is associated with significant morbidity and mortality, affecting more than 3 million people in the United States and 1-2% of the population worldwide. Its estimated prevalence is expected to double within the next 50 years. AF without associated heart disease: Approximately 30% to 45% of cases of paroxysmal AF and 20% to 25% of cases of persistent AF occur in young patients without demonstrable underlying disease. This is considered lone AF although, over the course of time, an underlying disease that may be causing the atrial fibrillation may appear. "An estimated 2.7–6.1 million people in the United States have AF. With the aging of the U.S. population, this number is expected to increase. "Approximately 2% of people younger than age 65 have AF, while about 9% of people aged 65 years or older have AF. "African Americans are less likely than those of European descent to have AF. Atrial Fibrillation (AF) symptoms vary on the functional state of the heart, the location of the fibrillation, and may exist without symptoms.,6 Individuals are usually aware of the irregular heart action and may report feeling palpitations or sensations of fluttering, skipping and pounding. Other symptoms experienced can be inadequate blood flow which can cause feelings of dizziness, chest pain, fainting, dyspnea, pallor, fatigue, nervousness, and cyanosis. More than six palpitations occurring in a minute or prolonged repeated palpitations should be reported to the physician. Over time, palpitations may disappear as the arrhythmia becomes permanent; it may become asymptomatic. This is common in the elderly. Some patients experience symptoms only during paroxysmal AF, or only intermittently during sustained AF. An initial appearance of AF may be caused by an embolic complication or an exacerbation of heart failure. Most patients complain of palpitations, chest pain, dyspnea, fatigue, lightheadedness, or syncope. Further, frequent urination (Polyuria) may be associated with the release of atrial natriuretic peptide, particularly as episodes of AF begin or terminate. An irregular pulse should raise the suspicion of AF. Patients may present initially with a transient ischemic attack (TIA) or ischemic stroke. Most patients experience asymptomatic episodes of arrhythmias before being diagnosed. Patients with mitral valve disease and heart failure often have higher incidence of AF. Intermittent episodes of AF may progress in duration and frequency. Over time many patients may develop sustained AF. For a newly diagnosed patient of AF, reversible causes such as pulmonary embolism, hyperthyroidism, pericarditis and MI should be investigated. Atrial factors: Any kind of structural heart disease may trigger remodeling of the heart. Structural remodeling such as atrial fibrosis and loss of muscle mass are the most frequent histopathological changes in AF which facilitates initiation and perpetuation of AF. Electrical remodeling occurs, which results in changes in the action potential and contributes to the maintenance of AF. In other words, when structural and electical changes occur in conjunction with AF, this perpetuates fibrillations. Ultimately AF causes delayed emptying from atria. This can increase the risk of stroke. Prolonged AF makes restoration and maintenance of sinus rhythm more difficult. Meds such as anticoagulants (commonly used along side these medications due to AF causing stroke) can cause brain hemorrhage. Benefits must be closely monitored. Presence of low-amplitude fibrillatory waves on ECG without defined P-waves 2. Irregularly irregular ventricular rhythm 3. Fibrillatory waves typically have a rate of > 300 beats per minute 4. Ventricular rate is typically between 100 and 160 beats per minute. Physical Exam: Irregular pulse, irregular jugular venous pulsations, variation in intensity of first heart sound. Atrial Fibrillation is a common early postoperative complication of cardiac and thoracic surgery. High concentrations of CRP, which confirm the presence of systemic inflammation are present in people with Atrial Fibrillation (AF). Changes in an individual's health such as a newly diagnosed complication may have psychological impact. Patients may experience depression and other psycho-social challenges as a result of changes in their health status, treatment, frequent visits to the physicians office, and fear of the unknown that may accompany a diagnosis of atrial fibrillation. Studies have demonstrated that a rate control strategy, with a target resting heart rate between 80 and 100 beats/minute, is recommended over rhythm control in the vast majority of patients. There is limited research on the effect of traditional physical therapy and Atrial Fibrillation. There is also conflicting information on the use of exercise to reduce the risk of AF. Since obesity is an important risk factor, management of weight through exercise and education is a crucial, proactive measure that may reduce the incidence of AF. However there is conflicting evidence in regard to the optimal prescription of exercise. 1. Hwang KO. Case Study: Acute and Long-term Management of Atrial Fibrillation. MedPage Today. 2015. Available from: MedPage Today. 2. Ezekowitz MD, Aikens TH, Nagarakanti R, Shapiro T. Atrial fibrillation: outpatient presentation and management. Circulation. 2011; 124: 95–99. Available from: American Heart Association. 3. Peake ST, Mehta PA, Dubrey SW. Atrial fibrillation-related cardiomyopathy: a case report. Journal of Medical Case Reports. 2007;1:111. Available from: National Center for Biotechnology Information. ↑ January CT, Wann LS, Alpert JS, Calkins H, Cigarroa JE, Cleveland JC, et al. 2014 ACC/AHA/ESC Guidelines for the Management of Patients with Atrial Fibrillation: Executive Summary. J Am Coll Cardiol. 2014: 64(21) p. 2246-80. ↑ 3.0 3.1 3.2 3.3 3.4 3.5 3.6 3.7 3.8 3.9 Fuster V, Rydén LE, Cannom DS, Crijns HJ, Curtis AB, Ellenbogen KA, et al. ACC/AHA/ESC 2006 Guidelines for the Management of Patients with Atrial Fibrillation: a report of the American College of Cardiology/American Heart Association Task Force on Practice Guidelines and the European Society of Cardiology Committee for Practice Guidelines (Writing Committee to Revise the 2001 Guidelines for the Management of Patients With Atrial Fibrillation): Developed in collaboration with the European Heart Rhythm Association and the Heart Rhythm Society. J Am Coll Cardiol. 2006: 114(7): p. 257-354. ↑ 4.0 4.1 4.2 Amerena JV, Walters TE, Mirzaee S, Kalman JM. Update on the management of atrial fibrillation. Med J Aust. 2013: 199(9): p. 592-7. ↑ 6.0 6.1 6.2 6.3 6.4 6.5 Goodman CC, Snyder TE. Differential Diagnosis for Physical Therapists, Screening for Referral. 5th ed. St. Louis Saunders; 2012. p. 264-266. ↑ 7.0 7.1 7.2 7.3 7.4 7.5 7.6 7.7 Wadke R. Atrial Fibrillation. Disease-a-Month. 2013 March: 59(3): 67-73. ↑ 8.0 8.1 8.2 8.3 Oishi ML, Xing S. Atrial fibrillation: Management strategies in the emergency department. Emerg Med Prac. 2013: 15(2): p. 1-26.